This post is adapted from the blog of Business Student.com, a Priceonomics Data Studio customer. Does your company have interesting data? Become a Priceonomics customer. Before diving into the data, a brief note on the methodology of our Business Jobs Index. The index is comprised of 127 popular business jobs. 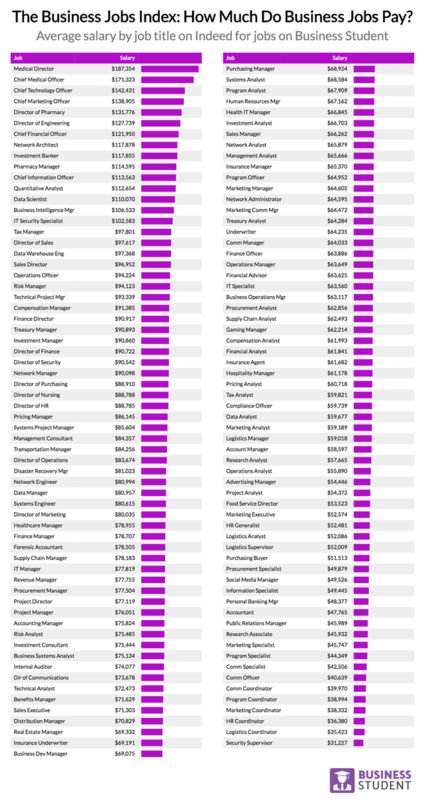 For each of these jobs, we track the average salary on Indeed.com by location. In our index, the highest paying jobs are senior positions in the medical industry or “C-suite” position like Chief Marketing Officer. The vast majority of the business jobs in our index pay less than a $100,000 salary however. Popular jobs like Social Media Manager, Accountant, and HR Coordinator all pay less than $50,000 per year. 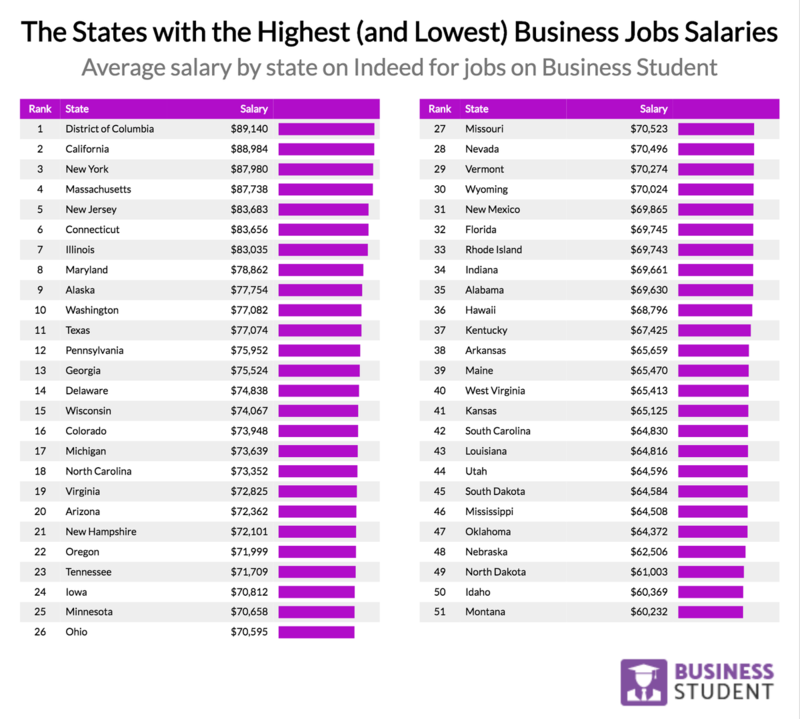 Washington DC, California, New York, and Massachusetts are the four highest paying places for business jobs, where the typical position pays around $90,000 per year. The lowest paying states for business jobs are mostly in the MidWest. 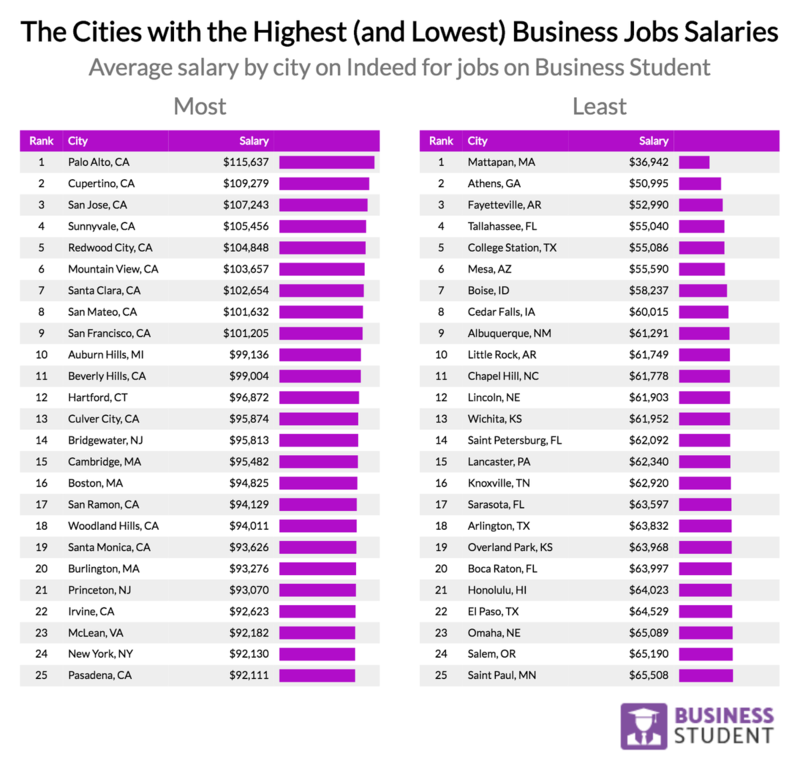 Almost unbelievable, the top nine highest paying cities for business jobs are all in the San Francisco Bay Area. The high cost of living and number technology employers have catapulted business salaries in the Bay to over $100,000 per year and nearly twice as much as cities on the “lowest” business salaries list. However, places that pay a lot of money also tend to be very expensive. We were curious, after you have to pay your rent, how much of your salary is left for anything else? Below, we show the average salary by city, the average monthly rent for a two bedroom apartment according to Rent Jungle, and how much money is left over on an annual basis. For it, we looked at the top 65 largest markets on our site (excluding Athens, GA where there was no rent data available). Keep in mind this is a preliminary analysis that doesn’t include taxes, child care, partner-earnings, or other factors that can influence cost of living. 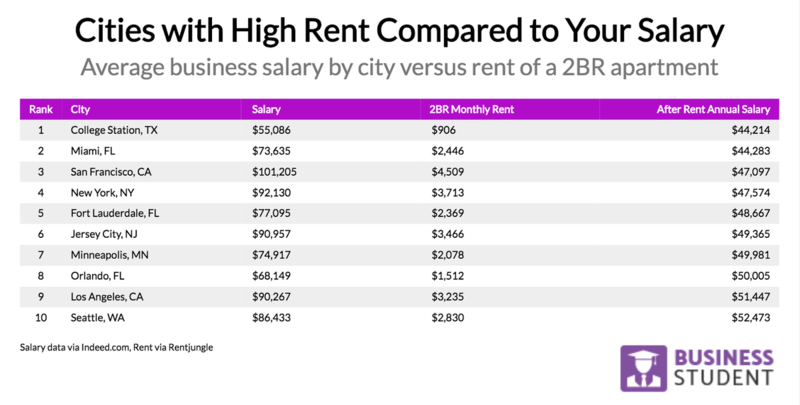 The cities where you have the most money leftover after rent are a mix of ones with high salaries (Palo Alto, San Jose, Sunnyvale) and ones with decently high salaries but low rents (Detroit, Chicago, Las Vegas). Considering that some of the states these cities are in have relatively high state income taxes (California) and others have zero state income tax (Texas, Nevada), further analysis should include taxes and other expenses. 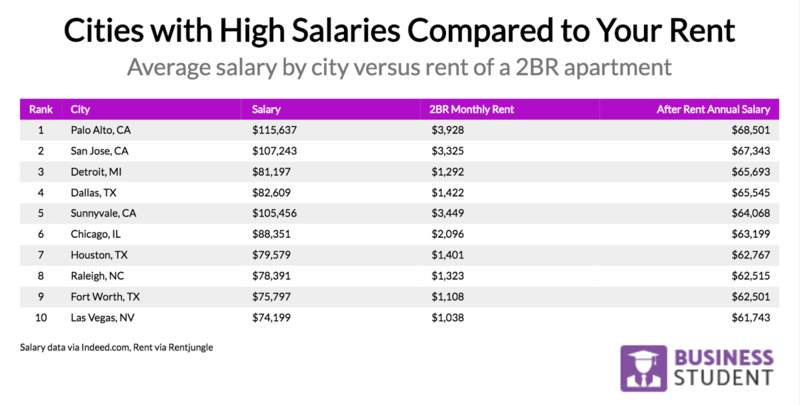 The places where most of your paycheck goes to rent is actually cities with high salaries but very high rent. Only College Station and Orlando have relatively low rent and make the list because of low salaries. 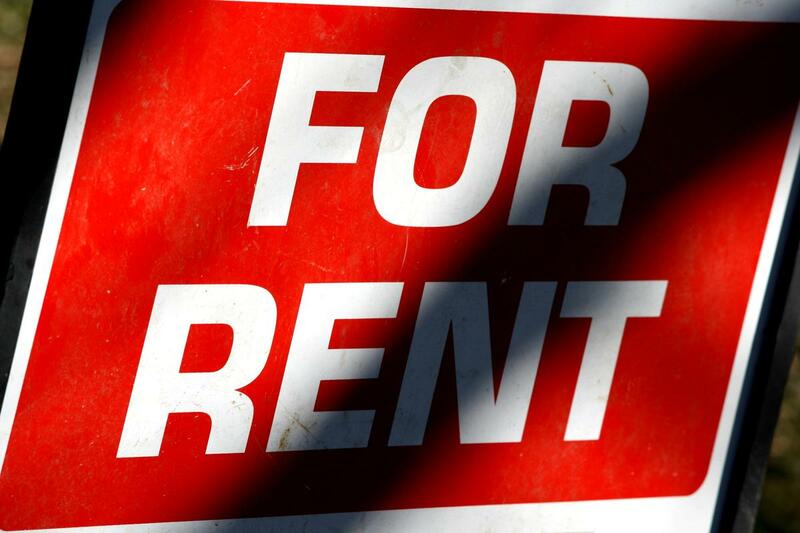 Most of the other cities are places like San Francisco with high salaries but exorbitant rent ($4,509 for an average two bedroom apartment rental). There is a huge variety of business jobs out there with an equal variance in salaries. Not all jobs pay a lot, but some do, especially in California, New York, Massachusetts and Washington, DC. However, cities that pay a lot in salaries also typically have very high cost of living. The city with the highest business salaries is Palo Alto, but it’s also a place with some of the highest property prices in the country. Additionally, some places like San Francisco and Los Angeles do have high salaries, but you don’t take home very much money after your rent.